I’ve known Injera—made from teff, an ancient Ethiopian grain—are gluten free, but not that they have other benefits too. 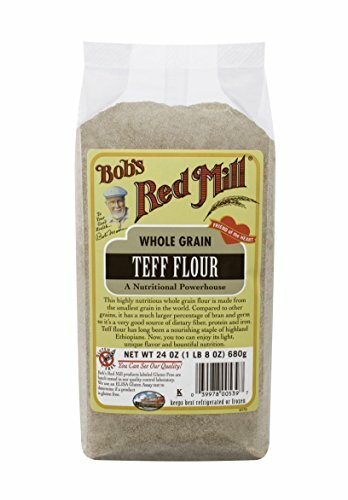 Bob’s Red Mill Whole Grain Teff Flour, 24-Ounce Packages (Pack of 4). From an SBS piece: “Ms Radd said Teff is also nutritious and can be used for a variety of things. If you do go to an Ethiopian restaurant, which I highly recommend, make sure they have injera made with teff and not wheat. The place I go to has both, so make sure you ask. Is Resistant Starch By Means of Potato Starch Bad For You? My thesis is that if it is, it’s not because of anything Grace Liu of Animal Pharm is feverishly posting, in five parts so far. The time for vitriol and snark is over; so this time, it’s just the facts, ma’am, and you can judge for yourselves. …I mean, really. If she’d just say, “I don’t recommend PS, I think there are better prebiotics,” then fine. I’d still think it plays a role, but whatever. Chocolate. Vanilla. But this endless cycle of “proof” that “PS is destroying gutz!! !” is quite ridiculous, smelling a lot more like a campaign to discredit those of us who’ve been advocating it than honest, science-based inquiry. Since I’m seeing little in the way of this “doctor’s” conclusions being challenged, I guess it’s time to do so semi-formally. This addresses just the first part of the last of her posts on the topic: High Dose Potato Starch Can Make You Fatter, Insulin Resistant By Lowering GLP-1 AND ESPECIALLY If You Are Missing Bifidobacteria longum and Akkermansia mucinophila, aka SAD Microbial Fingerprint (Part V) NSFW (December 24, 2014). The drop in the gut hormone GLP1 was quite significant and was one of the few parameters that met statistically significance in this study. Then she lists everything from Table 1 as “proof” that RS2 is bad vis-a-vis gut health or downstream consequences. The problem is, almost everything on that table is labelled NS, meaning not statistically significant. The few things that are not labelled NS, she misinterprets as BAD!!! For instance: “OMG GLP-1 decreased!” But what does Bodinham actually say? So, while fasting levels were lower, the after-meal effect was higher. GLP-1 has a half-life of 1-5 minutes in the blood. The lowered fasting GLP-1 is probably a good thing, but seen simply as a curiosity by Bodinham. To make a lesser point, her series is about potato starch, not HAM (high amylose maize RS2). Beyond the fact that the non-significant findings overlap in potential +/-, if you wanted to manipulate someone, would you tell them they were driving 13 in a 10 zone, or that they were breaking the speed limit by over 32%! All participants had well-controlled diabetes (mean HbA1c levels of 46.6 (s.e.m. 2) mmol/mol at screening) and were diet and exercise controlled (2/17), taking metformin (13/17) or metformin and pioglitazone (2/17), were weight stable, and excluded if they had a history of gastrointestinal, cardiovascular, or other endocrine diseases. However, whilst there are data from rodent studies showing increases in GLP-1 following RS intake – data confirming this effect in humans are lacking, and indeed, one study in humans has shown that it may take a year of increased fibre intake (increase of 20 g/day) to increase GLP-1 secretion. But just 2 years later, in 2014, he did show that RS2 raised postprandial GLP-1 in the human T2D subjects. So, all of this GLP-1 “proof” is completely wrong, and seems intentionally misleading. So, she uses a guy’s study to try and “prove” what’s not proved, implying it’s relevant to healthy people; is going to make them fat, when it actually involved diabetic people and improved their status on balance. Then, she finally acknowledges the diabetic point, but only to make a false distinction in healthy people, claiming results that don’t actually exist. Unfortunately, so very many just read post titles, skim—maybe check a few sycophant comments—and chalk it up to another “excellent post” by the “Gut Goddess” Fake Doctor. In contrast, there are over 130 posts here on RS and GutGeneral, over 10,000 comments, over two years. The positive anecdotes of N=1,000+ are legion. I can only conclude that she wants to stop or inhibit that for her own selfish gain, because she has statistically insignificant relevance to do with any shred of it. She’s made no long-term meaningful contributions—often inhibiting—but rather, only tried to dishonestly garner an unearned limelight. Finally, she’s spent five posts on a straw man, because except for diabetics and those who insist on remaining VLC, high dose potato starch was never touted as the be-all-cure-all. Not even from the very first post on RS. I’ve addressed this before. Now, this simply serves as something linkable next time someone asks me to address her idiotic posts that they don’t want to take the time to examine closely themselves. I watch quite a bit of Food Network when I don’t really want to search for anything to watch, so it’s whatever comes up. One of the shows I tend to like best is Ina Garten’s Barefoot Contessa, at least when she prepares simple rustic cuisine. So the other day, I saw her make a warm French lentil salad and had to give it a go myself. It’s super easy. Most curious about it is boiling the lentils with a whole peeled onion stabbed with cloves and a turnip cut in half (which are both discarded after cooking). A few key things to emphasize in terms of the preparation. Brining the lentils to a boil and immediately turning down to a light simmer, uncovered for 20 minutes, yielded perfect al dente lentils, ideal for a salad dish. Yes, only 3 minutes for the carrots and leek, then another minute with the garlic (I used 4 cloves). Remove and let sit in the same pan until the lentils are done. Soon as the lentils are done, drain and add them to the veggies, then stir in the dressing while it’s still hot. If you taste it immediately it’s going to taste salty. Patience. After it settles, it’ll be perfect. I found salmon to be a nice pairing, and you don’t even need to start it until the lentils are done and resting. Preheat your oven to 425. Pan fry the salmon on medium high, skin side down for 3 minutes. Then season with salt & pepper and drizzle some EVOO, and put the pan in the oven for 6 minutes. Way back in 2007, Art De Vany used to talk about his glutathione supplements and upon looking into it, I heard from numerous sources that it’s simply not bioavailable taken orally. Glutathione is generally regarded as the body’s master anti-oxidant. Glutathione (GSH) is an important antioxidant in plants, animals, fungi, and some bacteria and archaea, preventing damage to important cellular components caused by reactive oxygen species such as free radicals and peroxides. It is a tripeptide with a gamma peptide linkage between the carboxyl group of the glutamate side-chain and the amine group of cysteine (which is attached by normal peptide linkage to a glycine). Longtime reader and email correspondent Scott Miller excerpted this from the full text of the first study. …Witschi et al. (1992) have observed no increase in plasma GSH levels after a single oral supplementation of GSH to healthy human volunteers at 0.15 mmol/kg body weight. The present study confirmed these results [Figure 5(a) and (b)]. Based on these results, it has been suggested that the oral supplementation of GSH does not affect blood GSH levels. …The present study also demonstrated that only a negligible amount of GSH was bound to plasma protein before the supplementation of GSH. However, the protein-bound GSH significantly (P < 0.01) increased from 60 to 120 min after the oral supplementation of GSH. This is the first report to demonstrate an increase in GSH in the human blood fraction by the oral supplementation of GSH. The protein bound form GSH level in plasma after supplementation of GSH is much higher (>1000 times) than other food-derived peptides such as Val-Tyr 25 and Ile-Pro-Pro 26, but less than the food-derived collagen peptides in human blood. It has been thought that orally administered GSH is successively degraded to cysteinyl-glycine, cysteine, and glycine by γ-glutamyl-transferase and peptidase. Cysteine could be used for GSH synthesis in cells. Increased levels of protein-bound GSH might be derived from the newly synthesized GSH. The present study also detected fragment peptide (Cys-Gly) and precursor peptide (γGlu-Cys) as protein-bound form in human blood, which suggests some GSH is synthesized from degradation products of GSH. And from the second study. GSH levels in blood increased after 1, 3 and 6 months versus baseline at both doses. At 6 months, mean GSH levels increased 30-35 % in erythrocytes, plasma and lymphocytes and 260 % in buccal cells in the high-dose group (P < 0.05). GSH levels increased 17 and 29 % in blood and erythrocytes, respectively, in the low-dose group (P < 0.05). In most cases, the increases were dose and time dependent, and levels returned to baseline after a 1-month washout period. A reduction in oxidative stress in both GSH dose groups was indicated by decreases in the oxidized to reduced glutathione ratio in whole blood after 6 months. Natural killer cytotoxicity increased >twofold in the high-dose group versus placebo (P < 0.05) at 3 months. Life Extension Glutathione, Cysteine and C, 750 mg. The question is, how much do you need, and is there a potential downside? It’s all very complicated, all intertwined—in my view—with hormesis, autophagy, apoptotic clearance, and the push-pull, yin-yang relationship between methylglyoxal and glutathione. I’m intuitively resistant to the idea that if some is good, more must be better. So many processes seem to have opposing counterparts—inflammation being a classic example. Yes, chronic inflammation is bad, but many forms of acute inflammation are beneficial. Negative feedback mechanisms are enhanced by opposing positive feedbacks, and vice-versa. It’s the way nature operates to balance on the head of a pin. Those keeping tabs might recognize that much of this kind of thinking was recently introduced in part 1 of a new series: The Hormesis Files: Chronic Ketosis and The Case of The Missing Glutathione. Part 2 is coming soon, probably first part of the new year. But here’s one of the many relevant portions from that first post, which I encourage you to read. …If you didn’t catch that, what this study showed is that chronic ketogenic diets (3 weeks) appear to deplete the liver of glutathione in the same way as taking Tylenol every day! So, perhaps those most in need of supplementing glutathione, now that we know it’s bioavailable, would be those on low carb and ketogenic diets—as well as those who take Tylenol, or perhaps other analgesics or NSAIDs. I don’t think anyone came up with the reference for Santa as God Lite before I did, in around 1993.